Thanks to all who came out on Tuesday night for our Bail Reform Happy Hour, with Delegates Marcus Simon and Alfonso Lopez, and Commonwealth’s Attorney candidate Steve Descano. Turnout was incredible, and it was especially encouraging to see so many non-lawyers in attendance. We gathered at Clare and Don’s Beach Shack in Falls Church, VA, and thank Clare and Don’s for their incredible generosity. Marcus Simon and Alfonso Lopez spoke about the problem of our current cash bail system: when your release from jail depends on your ability to pay an amount of money, wealthy people bond out, and poor people don’t. For the latter, many of who are black and hispanic, even a stay in a jail as short as three days can have tremendously negative effects, including loss of employment, loss of housing and benefits, and increased recidivism. Nationwide, 34% of defendants are kept in jail pretrial solely because they are unable to pay a cash bond, and most of these people are among the poorest third of Americans. Locally, a significant majority of persons detained in Arlington and Falls Church are awaiting trial, still presumed innocent of the charges that are the reason they are detained. The movement to reform cash bail is looking to seize on the tremendous momentum toward reforming our justice system. It seeks to end this state of affairs legislatively and through the policies of local prosecutors. 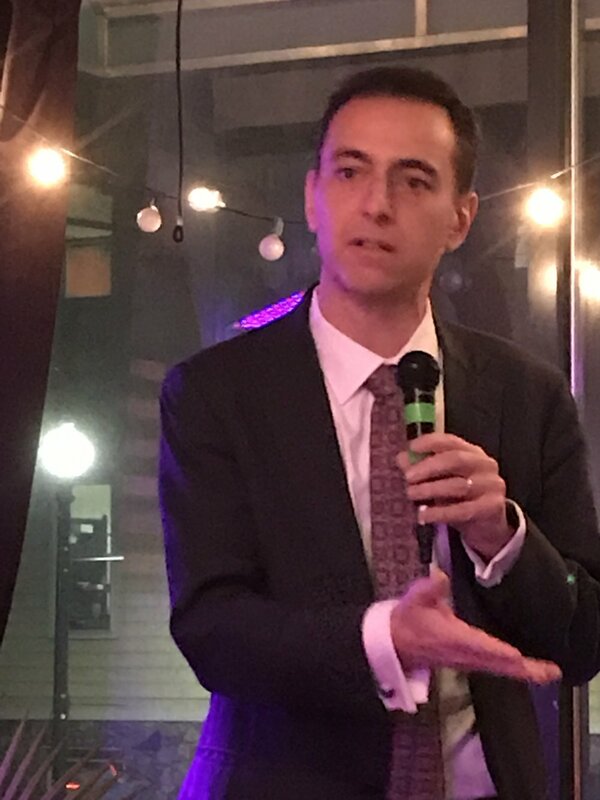 With respect to local prosecutors, both Delegate Simon and Mr. Descano challenged claims by prosecutors that change must come through the legislature. Change can come TODAY if our local Commonwealth’s Attorneys want it to. At the event, we also discussed the importance of being vigilant about remaining educated concerning the issues at hand. Criminal law and procedure can be complicated for non-lawyers, and opponents of reform are attempting to make regressive policies or meaningless “reforms” look like actual progress. They’re doing so to score political points, hoping that voters won’t be able to tell the difference. We’re betting that voters will—because we are committed to making it so. When it’s just the prosecutors versus the defense attorneys in Richmond, the defense stands no chance. It’s just a fact of our world -- opponents of justice reform have more money, more resources, and more connections with lawmakers. And although we have justice on our side, virtue is rarely enough to get things done in the political realm. Those who desire fairness for black and hispanic Virginians, the indigent, the mentally ill and substance-addicted, and all others disproportionately affected by our warped criminal courts... those of us who believe in social justice, racial justice and equal justice -- we must act. We must be more knowledgable and passionate, more united and relentless. We hope you all remain connected to our organization and others as we approach the 2019 legislative session and the 2019 elections. For more information about what issue we believe are most pressing, read our Justice Reform To-Do List. With your help, we truly can move justice forward in Virginia. Our next event is next Monday, a Juvenile Justice Forum we’ve joined as co-sponsors with the Virginia State Conference NAACP Criminal Justice Committee. More details can be found here. In addition, you’ll want to save the date for our 2019 Lobby Day, tentatively scheduled for January 18, 2019. We pick that day on purpose — it is the shameful Lee-Jackson Day “holiday” that Virginia continues to acknowledge. Public defenders — the front line soldiers in our fight and a key part of our organization — just happen to have the day off, and instead of honoring the memory of men who made their jobs necessary, they would rather fight to make their jobs obsolete (it’s just how we roll). By no means must you be a lawyer to attend our Lobby Day, however. In fact, if you’ve never done it before, we’ll train you! If you are interested in joining our Lobby Day this year, please send us an email at JusticeForwardVa@gmail.com.